Whole Foods Market (WFM has struggled to revive its business for years, so nominating new board members, no matter how impressive they are, will likely not keep its founder and CEO John Mackey safe from activist investor Jana Partners. "They definitely found very noteworthy and respected members to become a part of the new board," Karen Short, managing director of equity research at Barclays, told TheStreet. In addition to nominating five new board members on Wednesday, Whole Foods appointed Keith Manbeck as its new CFO and elected Gabrielle Sulzberger to replace long-time Chairman John Elstrott, a move urged by Jana and seen by many as Mackey's ploy to try to save himself from being ousted. But, Short said the board shakeup, plus its new strategic initiatives aimed at returning Whole Foods back to same-store sales growth by 2020, was just a forced reaction to Jana's activist campaign, seeing as Whole Foods lacked a "sense of urgency for the past five years." "I think [Mackey's] view is that he outsmarted [Jana]," Short said. "I wouldn't make the bet that you outsmarted a highly intelligent investor." 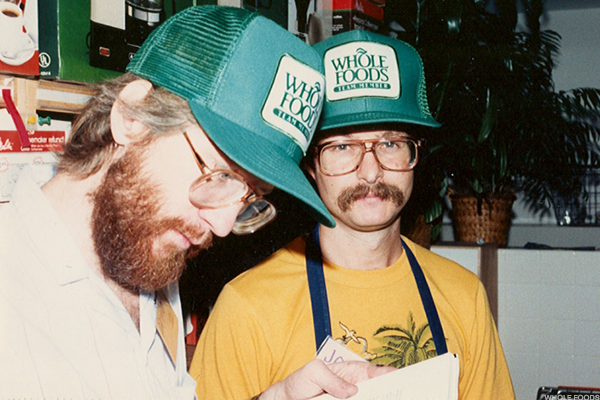 Whole Foods founder John Mackey (left). The new board appointees include Ken Hicks, the former chairman, president and CEO of Foot Locker (FL - Get Report) ; Joe Mansueto, founder and executive chairman of Morningstar (MORN - Get Report) ; Sharon McCollam, former executive vice president, chief administrative and chief financial officer of Best Buy (BBY - Get Report) ; Scott Powers, who held leadership positions at State Street Corporation (STT - Get Report) from 2008 to 2015; and Ron Shaich, founder, chairman and CEO of Panera Bread (PNRA . Coinciding with its tepid second-quarter earnings release and board overhaul Wednesday evening, Whole Foods launched strategic initiatives aimed at driving 2 percent same-store sales growth, total revenue of $18 billion and an EBITDA margin greater than 9.5 percent by 2020. The plans are also estimated to realize $300 million in additional cost savings. Short advised not to count on that outlook, seeing as it was endorsed by the old board, not the new. The old board was the same that provided guidance in 2014 for EBITDA of $2.2 billion by full-year 2018, which Barclays predicts will only come to $1.34 billion, 40 percent lower than the plan. "Mackey refers to this company as his baby and he will not let it go without a fight," Short said. But as for that guidance, it's just not realistic. Short has estimated that Whole Foods, once the "creator and owner" of the organic grocers market, has lost a "staggering" nine to 14 million customer visits over the past eighteen months to competitors like Kroger (KR - Get Report) , Trader Joe's, Costco (COST - Get Report) , Sprouts Farmers Markets (SFM - Get Report) and Natural Grocers (NGVC - Get Report) . After Wednesday's market close, Whole Foods reported second-quarter earnings of 37 cents a share on revenue of $3.74 billion, almost exactly in line with Wall Street's expectations. But, the company posted a same-store sales decline of 2.8 percent, a concerning trend for the organic grocer, as this is one of the main reasons Jana has been pushing Whole Foods to either sell itself or overhaul its board.